Pastor Les Simmons and his wife, Katrina, look over the former CalSkate facility off of Mack Road, which they have been converting into a community center for youth. The Sacramento City Council Tuesday approved spending $15.7 million to reduce homelessness in the city. 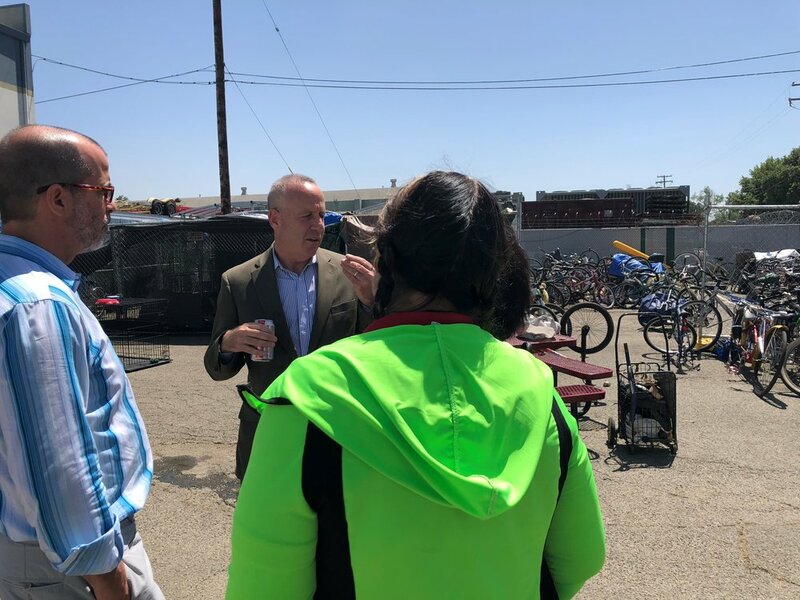 Mayor Darrell Steinberg intends to return next Tuesday for Council approval of his specific two-year plan for addressing homelessness by building 100 shelter beds in each of the eight Council district. “It is our intent next week to show a budget and a two-year plan for how we can get to a build-out of hundreds of beds that will allow us to house thousands,” Mayor Steinberg said. Combined with $12 million in existing and expected state dollars and $8 million in private contributions, the city is expected to have nearly $36 million to spend to open up new low-barrier shelters in the next two years. “This is a horrific public health and humanitarian crisis,” Mayor Steinberg said of homelessness. The mid-year budget approved by the Council also includes $11 million to shore up essential city services, including more funding for the city’s 311 service. “Our employees have been doing a lot more with less for a long time now,” said Councilmember Jay Schenirer. Mayor Steinberg also won approval for his proposal that the city spend about $2 million to expand community economic development capacity and programs serving youth. This allocation includes $350,000 to pay for “pop up” youth events throughout the city on Friday nights and another $1.01 million to assist with the improvement on such non-profit neighborhood youth hubs as the former CalSkate roller rink off Mack Road and a new sports complex planned for Robertson Community Center in Del Paso Heights. Councilmembers also allocated another $6 million in funding for youth that will go through the Measure U Community Advisory Committee and the City Council for approval. Two hundred people have applied for the 15 positions on the advisory committee. The expenditures approved by the Council on Tuesday came from one-time funds from the previous Measure U sales tax, a mid-year adjustment for higher-than-budgeted revenues, and funds from the new 1-cent Measure U that will be paid to the city before the new fiscal year begins July 1.